Balloons pollute the planet & kill wildlife. Helium is a FINITE resource – when its gone…its gone! Wednesday 5th Sept 2018, in the Library at lunchtime with Momoko. Students are allowed one entry in the competition. Prompt can be used as the starting sentence or overall theme. All entries must be submitted online via email to writingcomp@willihigh.vic.edu.au with the subject as: [Your Full Name: Title of Submission] or by another negotiated source (such as in hardcopy, in person to Mr Catalano). The winners of the Semester One Principal’s Writing Competition will be given the opportunity to attend the Melbourne Writer’s Festival, which is from the 24th of August to the 2nd of September. The Judges panel will consist of three teacher judges and two student judges. All students must submit their entries by the 11th of May 2018. Read this report from the Climate Council about risks to many of our tourism hot spots. 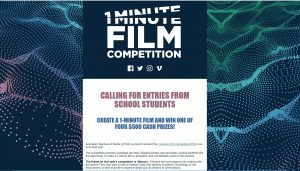 Want to Make a Movie & Win some Cash? What does the name High Tide mean to you? Please answer our one question survey! Category: CENTENARY, Fun Stuff, Library News, Survey, Vox Pop | 1 Comment on What does the name High Tide mean to you? Watch this animation to see temperature anomolies since 1900. Australia is at about 11 o’clock. Williamstown High School LOTE teachers are organising an essay writing competition for Junior and Senior students. All students from Years 10, 11 and 12 are to respond to the same topic (in ENGLISH), with individual winners in year levels to be awarded. All responses must be under 1000 words in length and submitted to: matthew.grose@willihigh.vic.edu.au before 3pm on 28th July. There are prizes for the winners, including travel and luggage packs from World Strides, brand new Lenovo tablets as well as a 3 night complimentary stay in a Hotel in Legian Bali. Animation of all the world’s earthquakes since the beginning of the 21st Century. Want to try the GAT before the day? Visit the VCAA website where you can find past copies of GAT papers and solutions. Yr. 10 – Eng. Iss. Yr. 11 – Eng. Iss. What to do with Pit…..